It's game on for Ubisoft Entertainment's new Winnipeg studio. 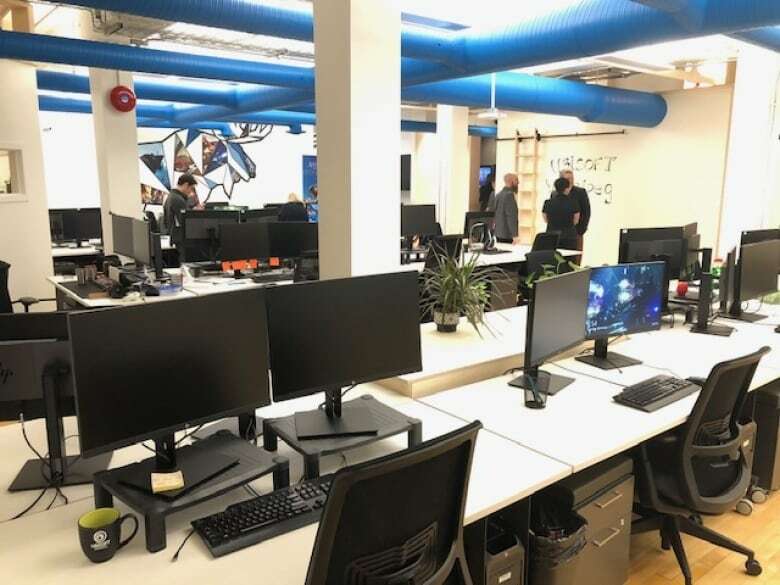 The video game giant officially opened its latest studio in Winnipeg's Exchange District Thursday, taking up space in the Merchants Building. 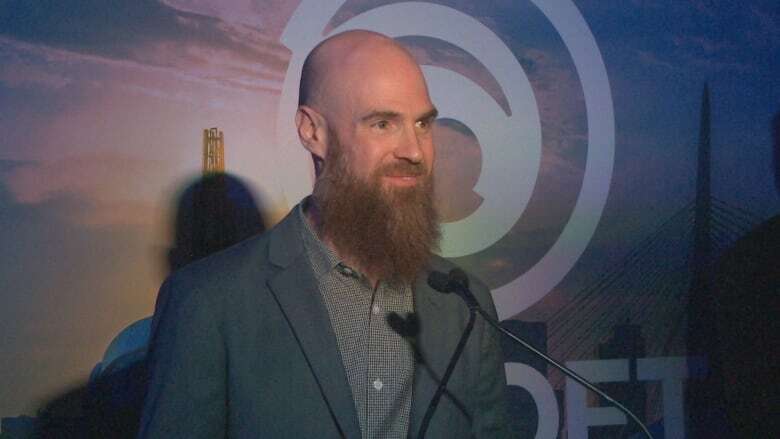 The building, listed as a Manitoba historic site, is the former home of a hardware store, a fact not lost on Ubisoft Winnipeg's managing director Darryl Long. "Fast forward a hundred years and I love the fact that we've evolved from hardware to software development," joked Long at the studio's unveiling Thursday evening. Plans for the Winnipeg studio, which will work on AAA games — an informal classification indicating the blockbusters of the game-design world including Assassins Creed and Far Cry — was announced in April. The Manitoba government helped lure the developer to Winnipeg with the province's interactive digital media tax credit, which provides a fully refundable income tax credit to companies that develop interactive digital media products. 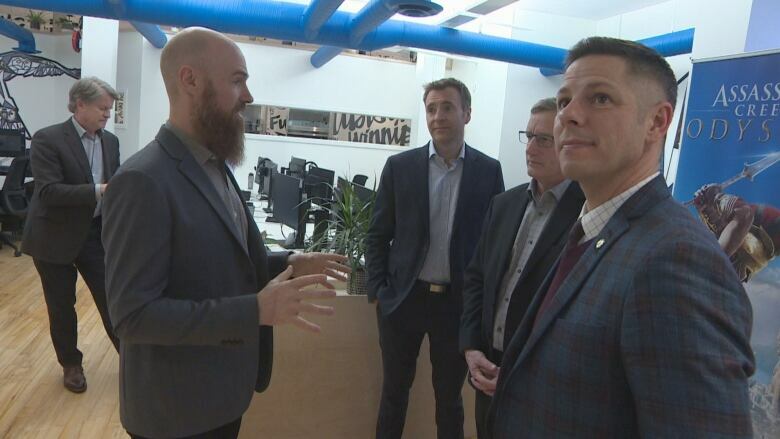 "This is a tremendous opportunity," said Blaine Pedersen, Manitoba's Minister of Growth, Enterprise and Trade, who joined Winnipeg mayor Brian Bowman at the event. "We are really excited for the potential for building the business here in Manitoba." The new studio already has 25 employees, some of whom are from Winnipeg, said Long, and Ubisoft has pledged to create a total of 100 new jobs and invest a total of $35 million in Manitoba over the next five years. 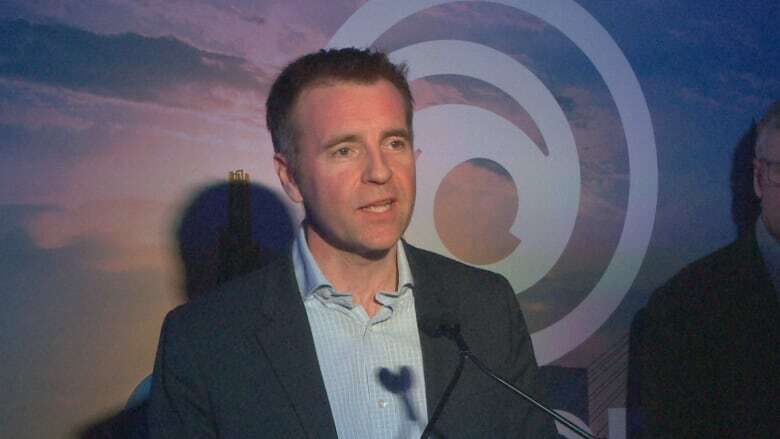 "This province is home to impressive techno-creative talent, and we made the right decision to be here," said Ubisoft Canada CEO Yannis Mallat. "We are excited to be part of this vibrant community." Mallat said the company wants to increase its current number of monthly online players from 20 million to 200 million by 2025. "To do so, our teams must create new, innovative technology that allows us to create more content, more efficiently," he said. "Our team in Winnipeg is instrumental in helping us achieve this ambitious goal." Long said the developers in Winnipeg will focus on innovation and doing game design differently. "We're pushing towards a new era of video game development where we're leveraging the cloud, artificial intelligence, procedural content, in order to make games more efficiently and be able to deliver better games to our players," he said. "We're the only Ubisoft studio that's dedicated specifically to building the technology and creating new game worlds." According to a release from the province the France-based company has more than 15,000 employees worldwide, including 5,000 here in Canada. The firm already has more than 30 studios in 18 countries, including offices in Toronto, Montreal, Quebec City and Halifax.